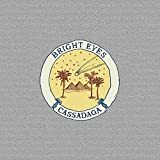 Conor Oberst releases his latest Bright Eyes album, Cassadaga, tomorrow, and to my ears it's his strongest yet. Other highly recommended CD releases this week include Blonde Redhead's 23; CocoRosie's uneven but still lovable The Adventures Of Ghosthorse & Stillborn; one pf my favorite albums of the year so far, Laura Veirs' Saltbreakers; and Scott Miller & the Commonwealth's live album, Reconstruction. The remastered (and partially re-recorded) Palo Santo by Shearwater is another reissue gem from Matador, complete with new artwork and a bonus disc of outtakes. I'm headed out tomorrow to pick up Madlib's The Other Side: Los Angeles, what else can you recommend from this week's CD release list.